Two important people who figure largely in the early history of the church are Thurstan, Archbishop of York from 1114 to 1140, who provided the land that enabled Beckingham to support a canon at Southwell Minster, and King Henry I, youngest son of William the Conqueror, who formally approved the gift. The list of prebendaries (click here to view) shows the first to be Herbert. The names of others that are known are given in the list, at least two of which became Bishops. The list after 1642 is believed to be complete, even though two names are missing and shows that the prebendary tended to hold his position for long periods of time. 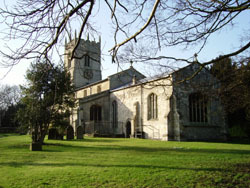 By the time Robert Sanderson became Canon of Beckingham in 1642, he had been a parish priest for many years and Royal Chaplain to King Charles I. The Civil War broke out that same year which must have made it extremely difficult combining his royal and parochial duties, made all the worse as his patrons were eliminated one by one. Incredibly, though he suffered harassment as a well-known royalist, he managed to survive without even losing his benefice. When the Restoration came in 1660, he was made Bishop of Lincoln and immediately became involved in the preparation of the Book of Common Prayer, the opening words of the Preface are attributed to him. Henry Watkins, who was prebendary at the time of the Act of Enclosure in 1776, held office for forty-six or more years. There was also a Henry Watkins who was a non-resident vicar of Beckingham from 1802 until 1845, though this can hardly have been the same man, but may have been his son. The list of vicars of Beckingham (click here to view) was originally prepared by K.S.S. Train of the Thoroton Society and is currently being updated. Little is known of the first few names on the list, but they become more than just a few names if thought of in relation to the times in which they exercised their ministry. William, the first priest, started his ministry in the year following the battle of Crecy, when English archers rained death upon the French armies. A year or two later the Black Death reached England and spread quickly. About one third of the population died. It may be that William himself perished, for priests were more at risk than most through visiting the sick and burying the dead. Further down the list Robert Apley was a chantry priest in 1546, a very troubled time. The act for the dissolution of the smaller monasteries had been passed ten years ealier and the spontaneous rebellion in Lincolnshire known as the Pilgrimage of Grace had quickly followed. The plunder of the greater monasteries took place in 1539 and in 1547 the chantries were surpressed and the village churches stripped of their valuables. Robert seems to have stayed on as Vicar of Beckingham. In the latter part of the 17th century vicars had responsibilities in nearby parishes, much as they have today. There is nothing to suggest that they did not take these duties seriously, although difficulties of travel must have limited the number of services that could be conducted. Later on the evils of pluralism emerged, this was a practice of accepting benefices for the income they brought and having a lowly paid curate to take the services. So for a period of 70 years Beckingham had vicars who resided elsewhere. Presumably this abuse ceased when James Stovin was instituted in 1845 for he and members of his family are buried in the churchyard. 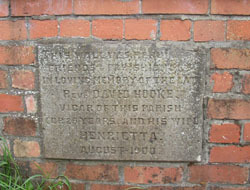 Another vicar buried in the churchyard is David Hooke who died on June 30th 1898. It was he who sponsored the restoration of 1892.On the wall dividing the churchyard from Church Street is a stone tablet with the following inscription. "THIS WALL WAS REBUILT BY FRIENDS AND PARISHIONERS IN LOVING MEMORY OF THE LATE DAVID HOOKE, VICAR OF THIS PARISH FOR 25 YEARS, AND HIS WIFE HENRIETTA, AUGUST 1900". A very practical memorial that is still serving its purpose. Ivan Turkington was a chaplain to His Royal Highness Prince Charles. The list of names of the clergy carries on to the present day and it is difficult to do justice to each one. Equally so to the many lay members of the church who have devoted their energies in various ways over the years. A few of these people are mentioned here, who have left their mark in some form. 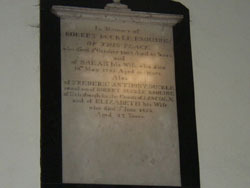 Apart from the stone commemorating Roger Nasone, which is mentioned in the Tour of the Church, the oldest memorial visible in the church is in the chancel floor inscribed "Eliz.th Ward, 1694". It is known from copies of wills that have survived that internments took place inside the church long before this date. One such will is that of Robert Hall made in 1529. As well as requesting that his body be buried within the church, Robert made some bequests to the church: - "to the high altar for forgotten tithes, 12 pence" (was this conscience money?) and "to the fabric of the crucifix, 15 shillings". Robert also remembered the friars at Doncaster, Tickhill, Lincoln and Newark with a bushel of barley each. They must have been a familiar sight in Beckingham, preaching the gospel and begging farmers for the necessities of life. Another will is that of Dorothy Kepeas who requested burial "afore the altar of Our Lady" (in what is now the vestry) shortly before she died in1534/35. The practice of internment within the body of the church seems to have lasted at least two hundred years. Near the altar on the chancel floor is a brass plate recording the death of Thomas Waterhouse in 1795. "Sacred To the memory of THOMAS WATERHOUSE ESQ Who Departed this life on the Twenty Third Day of July 1795 AGED FIFTY FIVE". He was one of the principal landowners of the parish and recorded in the church register in 1793 is the marriage of his daughter Anne to Dymoke Wells, son of the Rector of Willingham. What is not recorded is that the couple first eloped to Gretna Green to marry! It is said that Mr Waterhouse lived happily amongst his neighbours, was highly respected and for his amusement kept a pack of harriers. Evidently Dymoke Wells was a brave as well as a persistent young man! 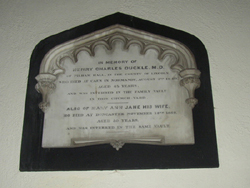 The Duckle family are commemorated by two stained glass windows and four wall tablets. They were also landowners of the parish. The first Robert Duckle is believed to have lived at Holme House. The second Robert Duckle is not commemorated in the church. Joseph Rudsdell who married into the Duckle family and also lived at Holme House, was an interesting character. He came from Morton, Lincolnshire and joined the 10th Infantry Regiment (later the Royal Lincolnshire) in 1805 as an ensign and served in Sicily and Spain during the last years of the Napoleonic Wars, reaching the rank of Major in 1823. In 1830 curiously, he joined the First or Grenadier Regiment of Foot Guards at the lower rank of captain and retired ten days later with the rank of Lieutenant-Colonel. Although it was possible at that time to buy rank, this does not seem very likely. It is probable he was engaged in diplomatic service in the eastern Mediterranean for which the higher rank was useful. He was made a Knight Commander of the Order of St Michael and St George in 1832. This order was founded in 1818 to bestow honourable distinction on natives of Malta and the Ionian Islands but was later extended to members of the Colonial and Diplomatic Service. Sir Joseph married in 1833 and lived in Beckingham until his death inn 1871. He is buried in the churchyard as are his wife and daughters. 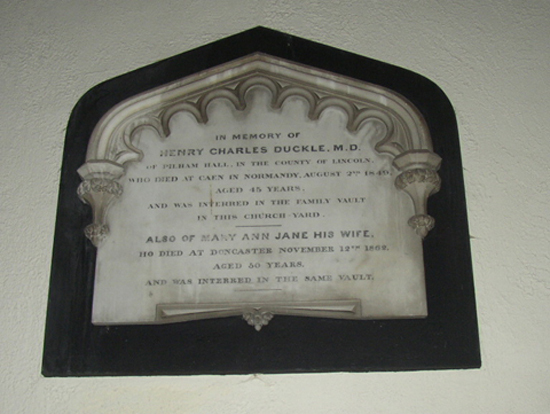 The Duckle's are believed to have a family vault outside the church.